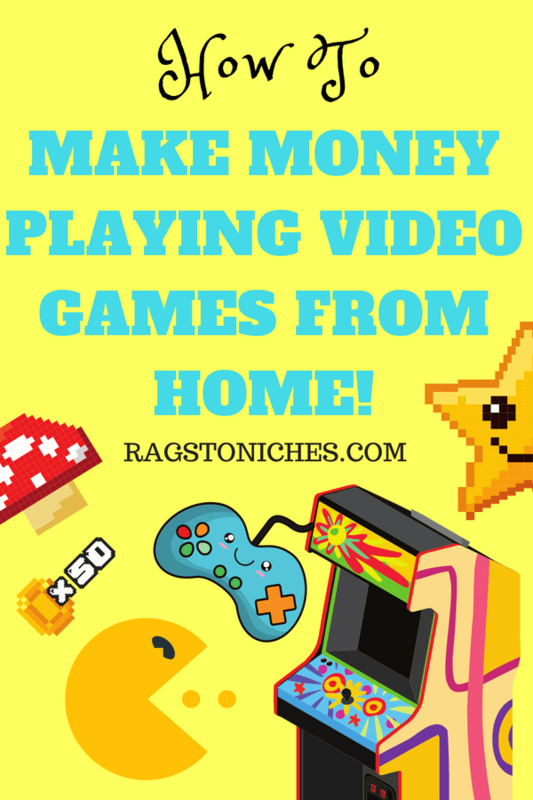 How To: Make Money Playing Video Games From Home! Last updated on January 15, 2019 By Nat 4 Comments This post may contain affiliate links. We appreciate you supporting Rags To Niches! Full disclosure here. Can you make money playing video games from home? In this post, I outline how you can & how to do it! As a child born in the 80’s, I don’t think I imagined that gaming would have become what it is today. Let alone that you could actually make crazy money from being a gamer online. In the 90’s, my Nintendo 64 got me through many a tough school day. Just knowing that it was waiting for me at home, gave me the boost I needed to get through some of those dismal days. But millions of people out there, from kids to teens, to adults, love to play video games – to the point of obsession. Sure, many people would gladly sit and play video games all day if they could. So, what if you could get paid to play video games? Is there a way you could actually earn money from your passion in this way? I’m not talking about earning the odd dollar here and there playing measly games online somewhere like Swagbucks, (pocket money site, but not for proper gamers) I’m talking about real money. Money you can quit your day-job for! Meaning, you don’t need anyone to employ you, you will be working for yourself. So, I’m going to look at three ways you could legitimately make money playing video games online. This is one way that I only recently delved into and it certainly has great potential for Gamers. You can earn money playing games from your own home; by becoming a live streamer on a platforms such as Twitch. At the time of writing, Twitch is now one of the most frequented sites on the net, with unique monthly views exceeding 100 million!!! On twitch, you can watch Gamers playing live; as well as watch professional tournaments and gaming talk shows. The interesting thing is; some of these online Gamers develop massive followings online; with hundreds of thousands of dedicated fans. If you can achieve this online superstar status – you can earn pretty handsomely from your efforts. By looking into twitches top earners online, you can see what potential this opportunity has. If you’re an average professional streamer; you may make in the region of $2000 – $5000 per month, (pretty decent, right?). On the higher end thouugh; some of the top players can bring in considerably more. Roughly speaking; anywhere from $100,000 – to a million+ a year, (yep, you did read that correctly). For example; via Ad revenue, YouTube Ad revenue, income from Twitch’s partnership program (paying around $3 for every 1k ad views, $5 a month for every subscriber); Amazon affiliate links, sponsorships and donations via paypal. One bonus about online streaming, is that you really don’t need very much to get started. As far as streaming goes, your console already has that inbuilt ability. But you will also need to record yourself and your voice as you play. To do this, you’ll need Kinect camera if you’re using an Xbox. A PS eye camera, if you’re on a Playstation. But if you’re using a PC, you will need broadcasting software, as well as a microphone and webcam. What Qualities Do You Need To Be A Good Streamer? If you’re a shy type who really hates the thought of thousands of people watching them and listening to them on camera; then this probably isn’t the gig for you! Not that you shouldn’t go ahead and try it anyway, you may be surprised. Being camera shy aside, there are going to be some additional qualities that could help you if you’d like to be a professional streamer. Having a good/clear speaking voice. If you’re a mumbler, or have an irritating tone to your voice, it’s unlikely that people are going to want to listen to you for a long period of time. It’s harsh, but that’s just the reality. Wouldn’t I know it, I have a pretty nasal voice myself and highly doubt people would want to listen to me! To give it your best shot – speak clearly and talk as though you’re chatting to a friend, which will help others relate to you. Having a strong personality. Obviously the people who are going to do the best at this, are going to be people with engaging personalities in some way. Some may be extremely amusing, (intentionally or unintentionally), some may have their own individual quirks that make them appealing to certain audiences, maybe some react in hilarious ways during their games. Whatever it is, you’re going to want to be appealing to people watching you. Again, you may not know how well you’re going to come across unless you just give it a go. They stick to a set schedule. Streamers that are successful will have a fixed schedule when they come on. This makes them predictable to their audience who will know exactly when they can catch them live. They talk to their viewers/fans on chat. Some of these Gamers are idolized just like you’d expect some celebrities are and some are also getting the paycheck to match. By giving your viewers some attention, they’re going to come back for more. So, be sure to engage with your viewers on chat and make them feel a part of the experience. They treat streaming as a business – if you want streaming to be a hobby, that’s likely what it will end up being. Becoming a successful streamer is going to take a certain amount of time, effort and dedication. The no.1 way you will ever bring in a decent income from this, is to grow your following. The more followers you have, the more money you can make. Most streamers will also be on YouTube as well, as it will provide them additional income potential. But you’re really not keen on showing your face on camera, you can still earn from playing video games online on YouTube alone. You can create videos with something like screen-cast-o-matic; which records only your screen. 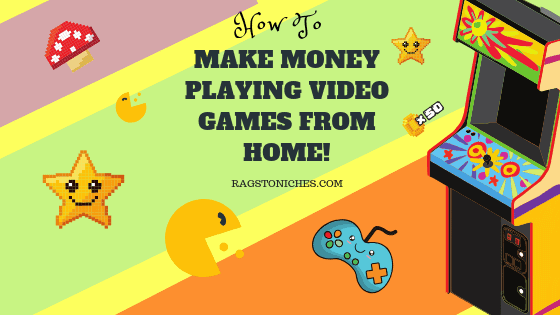 By videoing your screen playing certain games, reviewing games, or simply demonstrating tips/tricks and cheats – you can help other Gamers online and potentially earn money in the process. With YouTube, you can earn money via the YouTube partner program, (adding Ads to your videos) and this is a numbers game. The views your videos have, the more money you can make. Although, you really need many thousands of views a month to bring in decent money. How much you earn directly from the YouTube partner program, will depend on how many views you get. So, depending on how many subscribers/views you have, you should roughly earn anywhere from under $1 to $5 every 1000 views. If you have millions of views a month, you’ll be earning at the top end with the YouTube partner program. But that’s not the only way you can make money on YouTube. You can also earn from being sponsored to create certain videos, (for example; where you’ll be reviewing something gaming related in your case). Or through affiliate marketing, such as linking to a game on Amazon and earning commissions whenever someone buys via your link, (more about that below). If you can’t stand the thought of being on camera and prefer to stay in the background entirely, then there is also another way that you can profit from your love of gaming. You can build a website/blog within a certain niche area of gaming that appeals to you and fill it with related content, (blog posts and so on). You can write reviews, tips and tricks and write relevant sponsored posts once you build up a following and there are many ways that you can earn from your blog once it’s established and you have a following. While reviewing games can be time consuming and it’s difficult to keep up, with the never ending surge of new games being released – you don’t necessarily have to just do this alone, you could hire writers to do some of the hard work for you, (this doesn’t have to be expensive at all, see below). While I recommend starting off on your own at first, you can find decent writers for an affordable price somewhere like upwork and specifically search for people with an expertise and knowledge in a certain field. You don’t only need to be just writing reviews either. Writing about anything gaming related is going to be a potential topic for your blog. Including gaming news, interviewing popular Gamers out there; or simply writing about certain hot topics in the gaming world. Without a doubt, if you aren’t afraid of getting on YouTube, creating videos can be a great way to direct traffic to your blog – as well as another potential income stream. If you’re a streamer, having a blog as well is just another way you can boost your earning online in the long term and another way for Gamers to discover you. Having a blog or website can be the backbone to your business online, however you choose to go about making money from gaming. It’s much easier than you think! In fact it’s really simple. When I came online, I had zero technical knowledge. I didn’t know what SEO meant, let alone what affiliate marketing was. I got clued up initially with some free training over here and that’s where I got started. I have reviewed that platform in depth here, and it’s worth joining if you are thinking about setting up a blog in the gaming niche, (or any niche for that matter!). If you have any questions at all, don’t hesitate to ask me below in the comments section. 40+ ways to make your first dollar online! How to make your first affiliate sale online. This is a great article with great ways to get paid playing video games, which is something we all do for free anyway, but they forgot to mention the fact that you can get paid for testing video games that haven’t came out yet! I actually do this and make more than I did at my 9-5 just off of this website (link removed) it cost to start but you make that money and more back, I highly recommend. Hmmmm… yes unfortunately I removed that affiliate link. I do not recommend that company and reviewed it previously here.